Lift And Place VERSA-LOK Standard Retaining Wall Units Easily. 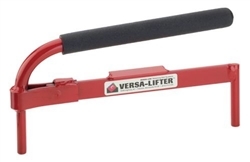 The VERSA-Lifter makes it easier to lift and place VERSA-LOK Standard units, especially on the base course. The two prongs on the lifter are placed into the holes in the VERSA-LOK unit. The action of lifting the handle secures the lifter to the unit and makes for easy, balanced lifting and placement. NOTE: Not for use with VERSA-LOK Square Foot units.